You know they say shine bright like a diamond, well I prefer shine bright like the stars, because when you think about, diamonds need some light to shine, whereas stars shine brightly all on their own! In fact, they light up the entire universe! This card is a personal favourite of mine, yes, ok, it may have something to do with the fact I love astrophysics... but who doesn't love galaxies! Also it is quite easy to make a bunch of these in one go! I cheated a little with the note cards this time. 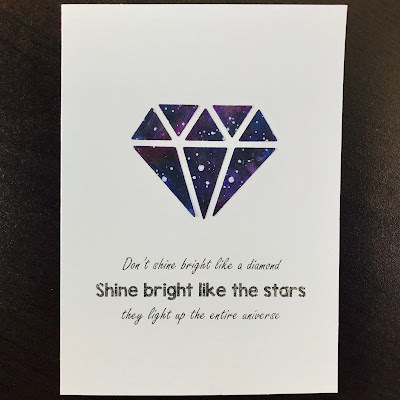 I bought a note card pack from Kmart and printed the sentiment onto the note card (if you have a laser printer you could do some foiling for the sentiments). Of course you could write the sentiment onto the card directly, but I don't have the neatest handwriting so printing my sentiment was the best way to go. For the galaxy diamond I used watercolour paints, shimmer mists and white paint. I first painted splotches of navy blue and purple and added hints of pink onto some white cardstock. After heat setting again I mixed some black shimmer mist and black watercolour to together and messily splotched it on top (note, I used a heat gun just to speed up the process, you could instead let it dry for a few hours, but it lengthens the process a lot, especially if you add layers of colour). Then I flecked some white paint onto the watercolour panel to add some stars. I think adding the black shimmer mist helped the galaxy looked more detailed. I cut out a diamond using a diamond die. Using the outer part of the die-cut as a stencil I centred and adhered the inner parts of the stencil onto the card using some double sided tape, then I removed the stencil. Instead of using a die you could cut out a diamond using a template. 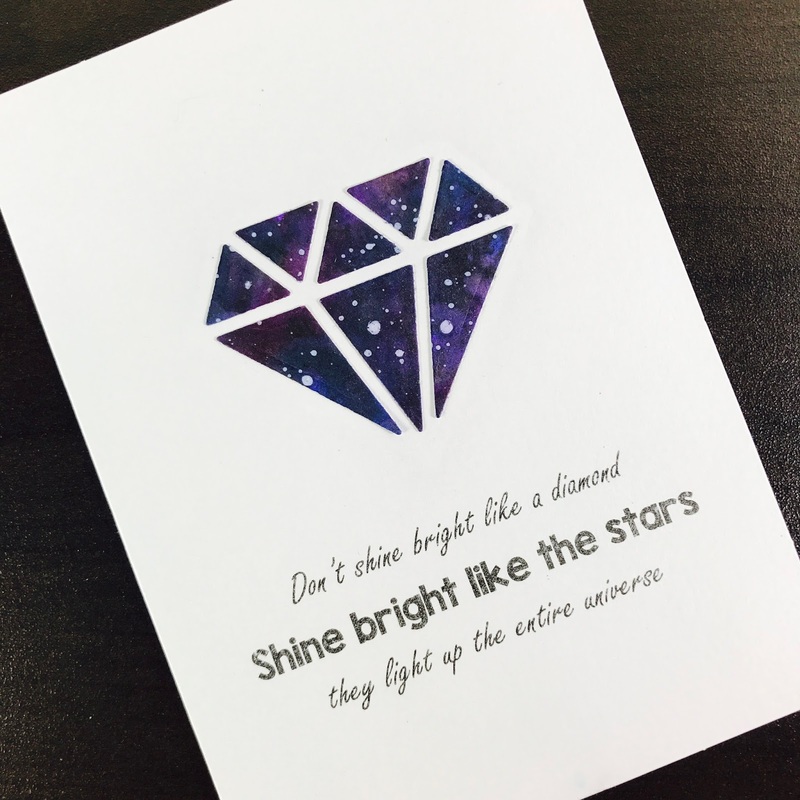 So I thought this was a nice motivational card to give to someone (I mean I have my university exams coming up so I may give this card to myself... XD). Remember to stay positive and shine bright like the stars.